Marbles store inside project. Chinese Checker game on top. Turn over for a game of "Aggravation" or "Marble Chase". 16 inch dia. 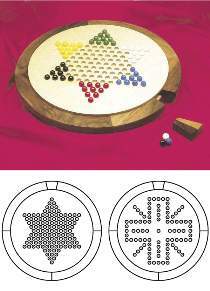 *Special includes plan, chinese checker assortment, 1/4" x 24" x 24" birch plywood, and magnetic catch.